PhD’s! Need Help Getting Published? Here’s How . Hello and welcome back! 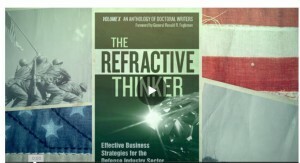 My name is Dr. Cheryl Lentz, owner of The Refractive Thinker® Press. Today our focus is on Tips for Effective Graduate & Post Doctoral Writing: How to Create Your Writing System. We begin first with the simple steps. Creating your own writing system should be simple and include only a few short steps. Once you have designed these steps, you need to write each paper the same way every time. I offer the following 5-step process as one system to consider. I call this step: Specking out My Paper. Think of this as the specifications or specs for a project. I simply create the framework and collect all the individual pieces that I will need. As a former student, I created a master writing template—that included all the elements that a properly formatted paper would require. Tables, Figures, and Appendices (if needed). I would simply open this document, hit the Save As button within Microsoft Word, and save for my new class. Next, I would simply delete (or keep) the elements that I needed for this current assignment. Once I have my sample paper elements in place, I now focus my paper on the assignment rubric. I read the assignment and think about it for a moment. What is it that I am being asked to do? Do I know about this subject already or is additional research required? If I am already familiar with the subject then I would proceed to compiling my research in terms of books, peer reviewed journal articles, as well as the course textbook(s). Helpful hint: Remember that a Bibliography is all the resources that I consult, while a References List is all the resources that I will actually use in the paper itself [in the form of either in paper quotes or paraphrase citations.] Do not confuse the two. Remember References are APA format, while Works Cited is MLA format. I now then create my references list from these sources. I then print out and keep next to me as I write the paper. At the graduate level, 2-3 peer review sources beyond the class text are expected. If I am not familiar with the subject matter, then I will stop, and begin the research process. [Do you have your research system in place?]. This is another video topic. Once I have my sources in place, I now turn to writing the paper itself—and the Writing Roadmap. I now carefully craft my Introduction. To be candid, this is really already written for you in draft form as the goal of any introduction is to (1) introduce your topic and your (2) writing objectives in your own words—all carefully crafted from your assignment as listed in your course syllabus. Remember that writing fundamentals are the same, whether you are writing a single paragraph or the greatest American novel. Every writing piece should have an introduction, body, and conclusion. Introduction: Tells your reader what to expect in the paragraphs that follow (Future tense). Body: Provides your reader with the details of the writing (Present Tense). Conclusion: Tells your reader what you told them by offering a (1) review of the main points and (2) a review of your writing objectives from your introduction (Past Tense). The purpose of this paper is to talk about the three relevant areas of critical thinking to include (a) thinking, (b) critical thinking, and (c) refractive thinking. Then your Writing Roadmap would look like this. *For my conclusion, I simply copy and paste my introduction—change to the past tense and make some adjustments. Now it’s time to edit. Helpful tip? Never edit your paper the same time or day that you write it. This will help avoid the “I thought those words were already in my paper” syndrome. I typically plan each of these steps on a different day—where my writing system will take 5 days to complete. Sometimes I may combine these steps into the same day, but never at the same sitting. If you find that your time is compressed, simply take at least a 1-2 hour break between steps. Be sure to run Microsoft Words’ spell and grammar checker. Please be sure to run your paper through your universities automated spell and grammar checker, and your in person faculty program. Find a friend, family member, class colleague, or learning team member to also review. Please be sure to submit your paper through your universities plagiarism checker (Typically, most universities use either Turnitin or Safe Assign). Read your paper out loud for additional clarity. If you are really good, try reading your papers backward, starting at the end first. Be sure to actually REVIEW AND CHANGE the suggested feedback that is offered. The purpose is to catch these opportunities for correction prior to submission to your respective faculty. Finally, be sure to take one final review of your paper. Be sure to start at the beginning with the assignment instructions. Be sure to review the grading rubric that many faculty and universities provide. Put yourself in the position of your faculty and simply grade your paper yourself. Please be sure to read the rubric and the assignment again—word for word—to ensure that your writing meets all of the writing objectives. That’s it—a 5-step process for writing more effective academic papers. For more tips on effective academic writing, please visit my blog at refractivethinker.com/wordpress. Thank you againfor joining me today. My name is Dr. Cheryl Lentz and I hope you find these suggestions within this video helpful. Good luck to you in your academic writing pursuits. Cheers! This transcript accompanies the YouTube video which can be seen within this blog. Enjoy the video as well. The Refractive Thinker® Press, where discriminating scholars publish. Do you manage time or does time manage you? Can you Afford not to pay Attention? Time Management: Are we our own Project Manager? Analysis vs. Synthesis: Do you know the difference? Free Writing Tips. Sign up!